Welcome to our profile page. Enjoy learning more about some of the members of our company. 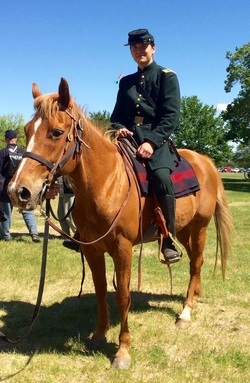 ​ Captain Whitehall or "Skipper" has served Company D faithfully since 2008 working his way through the ranks from private, corporal and 1st Sgt. until receiving his commission to Captain in 2015. He understands the full inner working of how the company should move and behave and has striven to set the example to company NCO's and Privates alike, Captain Whitehall leads from the front to push and encourage fellow sharpshooters to greater acts on and off the field and would never ask anyone to do something he wouldn't do himself. Most importantly enjoys teaching new members and public alike about the history of the United States Sharpshooters and the Civil War and the esprit de corps of Company D and all its members. The 1st Sgt. enjoys the opportunity to experience how life might have been for soldiers of Company D and to build interest and appreciation of the Civil War and the lives of the men and women who lived through it. Inspired by his persona character, James Pendleton, Koepp has pursued traditional woodworking and is the company joiner/carpenter making many of the unit's historical reproductions. 1st Sgt. joined the Sharpshooters because of their passion for recruiting, their unique tactics, and the challenge of accurately portraying a "specialty unit" in the hobby. I became interested in reenacting as a freshman in high school when I met Ethan. He would share stories about events with me whenever we talked and as a history nerd (now an anthropology and history major), I grew more and more interested in what sounded like an exciting hobby. I finally joined in 2015 and I have never regretted it! This unit has become more of a family than a group of friends. I was initially worried it would take some time to be accepted, but that did not happen. I found everyone to be friendly, and helpful. They answered any question I may have had with an attitude that stated "there are no stupid questions." A few things I really enjoy about Co. D, are the attention to detail and the fact that we always hold ourselves to a high level of safety. The one time I dropped my rifle, the Captain ordered me to do a French charge which consists of a run with the rifle held at arms length over my head. I have never dropped mine since. I am still new to being a company clerk, but I am looking forward to the challenge of learning new duties and holding more responsibility in the unit. In short, reenacting has become more of a passion than a hobby for me personally. I have learned more than I ever expected doing this, and I have a better idea of what a soldier actually went through. "What is the terror of death? That we die with our work incomplete. What is the joy of life? To die knowing our task is done." I really enjoy this amazing hobby because it gave me a way to both learn and teach more through visual and hands on experiences. It's really become a passion of mine. What drew me to the Sharpshooters was their uniqueness in so many ways. Next was their obvious passion for training hard and really working with you. I give this amazing group, that has become more of a family to me, so much credit for building my confidence. They are amazing at lifting you up and are always encouraging you to do your best. My name is James Soderling. I am a Molecular Biology and Biotechnology major at the University of Idaho in Moscow, but I originally hail from Coeur d’Alene, Idaho. My first reenactment was at Spokane Falls, WA during 8th grade, where I fell in with the USS Tahoma Marine Guard. We sustained heavy casualties, and, through a trick of fate, I ended up tagging along with the 2nd USSS. I started hanging out with then-First Sergeant Whitehall the next season at Deep Creek, WA. In 2015, I finally decided to trade in my blue, white, and red Marine Corps uniform for Sharpshooter green, and I have not regretted it. The Sharpshooters are a wonderful fit for me. Everyone is amazingly research-oriented, and we are holding fast against the tide of farbiness and re-enactorisms that are flooding the hobby right now. Attending the University of Idaho has allowed me to get ahold of some rather unique documents, including a report to the Governor of Maine that is in essence a unit roster dated to December 31, 1862. This is definitely a unit that is dedicated to constantly improving their impression; every time any number of us get together, every conversation starts with “I found this online” or “that sailor from Maine sent me an email that said”. With that in mind, I plan to one day have two full uniforms: a solid green and a solid blue with a civilian hat so that I can change out my “issued” green uniform pieces with “replacement” pieces to better portray early-, mid-, and late-war impressions. Reenacting and history are my passions. I had the good fortune of having three wonderful history teachers: Mr. Cox in middle school, Mrs. Alderman my sophomore year of high school, and Mr. Stuermer my junior year. Not everyone has access to such amazing teachers who inspire a love of history and culture in their students, but through reenactment and living history events, I can help fill that gap. First Sergeant Koepp asked for a military quote to go with each company member’s profile. I thought for a long time about what I would choose. I did not want to choose something that glorifies the horrible, horrible thing that is war, but I also have no desire to disrespect the memory of any warrior, past or present. I think my offering fits both of those criteria. 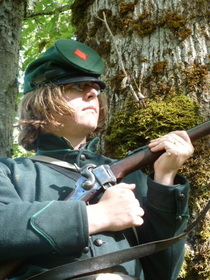 I got into reenacting due to a deep love of history more so the military aspect. I wanted to see how the troops lived and thought it would be a great way to get more practical knowledge. I found the WCWA and started looking at a few units. Eventually, I found and got hold of the captain and first sergeant and talked with them about joining and I did after my first event due to the family and atmosphere of the Sharpshooters. I have now been with them for a year and have loved every moment due to the fact I have people I can go to and have a family in the Sharpshooters. "Marines don't die they regroup in hell and push on." I started my reenacting life in the early 90's doing World War One. Sometime in the late 90's I encountered a guy from the WCWA who was with the 26th North Carolina who wanted to try out WWI and in turn encouraged me to come participate in a Civil War event in Arlington, WA. It didn't really take due to the fact that I couldn't warm up to the idea of being a Confederate. A number of years passed and I got a call from a member of the WCWA asking if I would participate in a Memorial Day ceremony in which reenactors represented soldiers from different periods of American history and they needed a WWI guy so I came to the event which was to follow a WCWA reenactment at which time I decided to join the 3rd Michigan who I was with for around 6 or 7 years. Like a husband that grows indifferent with his dull wife while eyeing the hot lady next door, I became indifferent to my dull regiment and "you guessed it" ...the Berdan Sharpshooters were like the hot lady next door, so I packed up my bags, got the Sharps and uniform and moved next door. I love these guys. If you get tired of your regiment or your wife, join us, bring a cup, and I will share my Canadian tea. Pvt. Edwards is a transplant from Ohio, as the Army brought him to the Pacific Northwest. Starting in January 2004 with the then 21st Ohio Volunteer Light Artillery, now the 1st Ohio Light Artillery Battery H, he gained a sense of appreciation and value that the original member went through during the Civil War. In the off season of 2005/2006 he wanted to pursue a different aspect of troops during the time and co-founded the 1st United States Sharp Shooter Company G (Wisconsin) with members of his artillery unit as was attached to them. During his time he started to heavily research into the equipment, clothing, and materials being used by the soldiers. After researching and contacting individuals that are very well knowledgeable in the Sharp Shooters, Dan Wambaugh and Brian White, the strive to progress Company G towards a realm of being authentic, failed and he left the unit. After a brief stint with, the now defunct Confederate unit, 9th Virginia Infantry, Company F, during the 2007 year, he found himself as a member of one of the leading Sharp Shooter units, 2nd United States Sharpshooters, Company C (Pennsylvania) at the 145th Gettysburg Reenactment. Under their guidance and comradeship, his knowledge and kit greatly improved. He found the unit he looking for, a progressive unit. Joseph had to leave Company C unfortunately due to his entrance of service in the Army. He is stationed at Joint Base Lewis-McCord and now calls the 2nd United States Sharp Shooters, Company D (Maine), his home. His main focus of research is of clothing, equipment, and tactics of the Civil War. The memorable moments of reenacting is portraying the 21st Michigan Infantry with the reenacting unit, The Chesapeake Volunteer Guard, at the 145th Bentonville Reenactment. They bivouac and fought on the actual Bentonville Battlefield.